A long weekend in Barcelona to break out from the daily routine, stay offline as much as possible, discover this beautiful city and eat a lot of yummy Spanish food. That was the plan I made with my friend before our trip to Catalunya’s capital. Being the foodie that I’m, I was really excited about Barcelona. I’ve been to Spain before (Andalusia) and I know how good the food is. I was really looking forward to trying out the Catalan cuisine. I usually do the homework before any trip but since we wanted to simply relax in Barcelona, I didn’t particularly look up what to eat or where. Instead, I let the city offer us all its goodness. 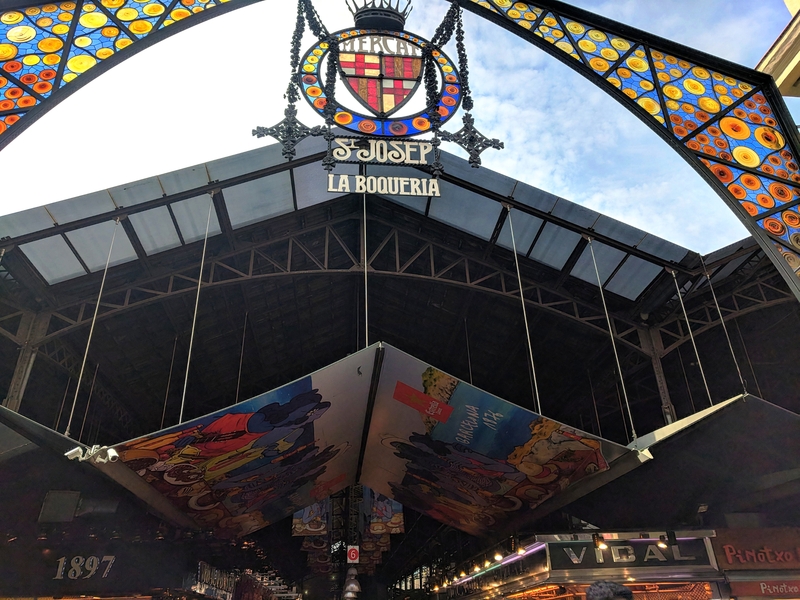 La Boqueria is a public food market , it’s also one of Barcelona’s touristic landmarks. Despite how crowded it was, our stroll in la Boqueria was fun. 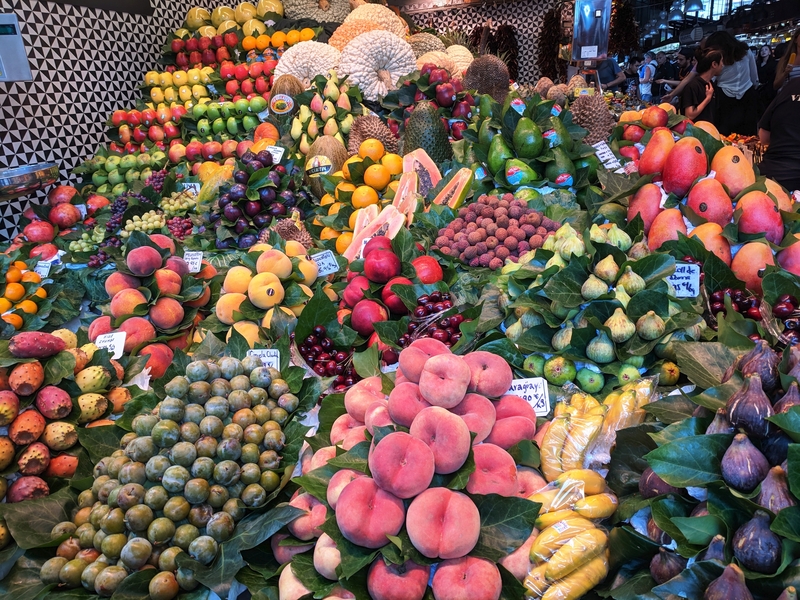 Colourful fresh fruit and vegetables, nuts, spices, seafood, meats, jamon, there was something for everyone. 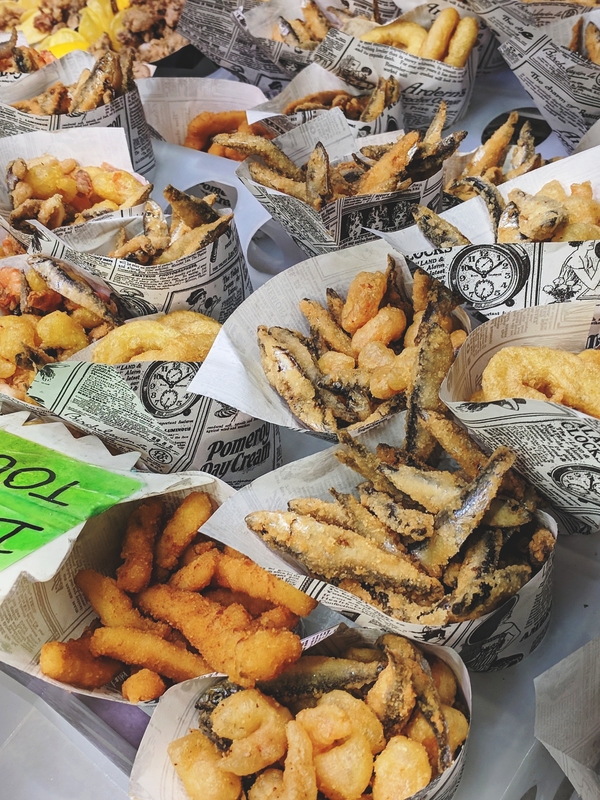 In addition to fresh ingredients, there are also plenty of bars and restaurants offering tapas and seafood. It was so busy so we opted for a takeaway. 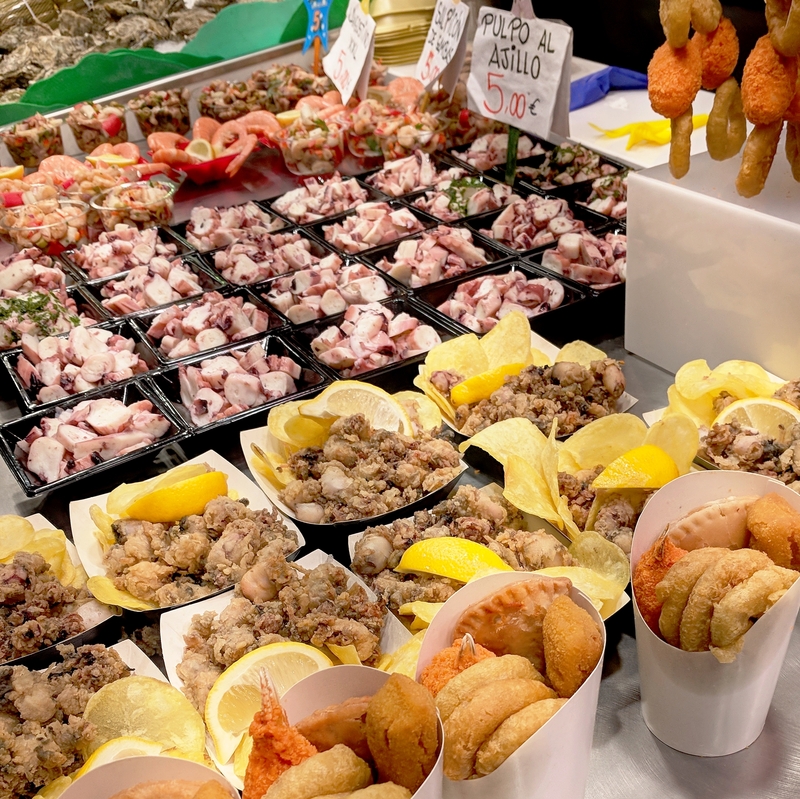 I love seafood, I couldn’t resist the beautiful display of overpriced fried seafood mix and of course I had to eat octopus while in Barcelona so I also got pulpo Al Ajillo (sauteed octopus in garlic). I totally ordered too much food but that’s what I do for my first meal everytime I’m visiting a new city. I’m yet to learn! Was it the best food I’ve ever had?No. 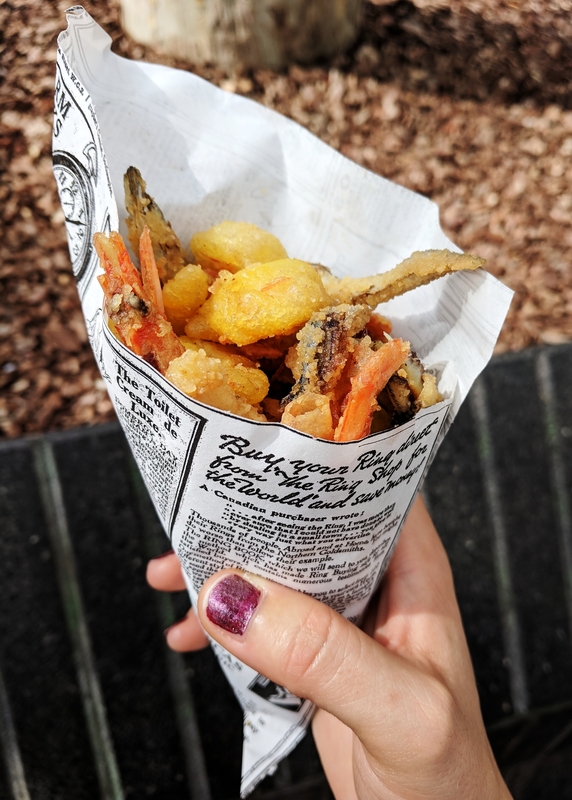 Was it the best food I had in Barcelona? Also no. But I still recommend a visit to la Boqueria and a taste of its food. Right on La Rambla, there’s a small gelateria called Rocambolesc. The Rocambolesc project starts from the willingness of Jordi Roca to recover the traditional dessert cart of El Celler de Can Roca which had disappeared from the restaurant’s room just when he took care of the sweet part of the menu. El Celler de Can Roca is a 3 Michelan star restaurant voted best restaurant in the world few times. Fancy! We didn’t know any of this about the cosy gelateria. It just cought our attention since it was next to our hotel and looked cute. Also they have these fun- shaped ice-creams. As we were examining what Rocambolesc has to offer, we noticed people ordering this bread filled with ice-cream then put inside a maker similar to a waffles or panini maker. We were intrigued and wanted to try this thing called Panet. Panet was so popular, it took us 2 days and 3 attempts to finally be able to order it. It was so worth it! Hot crunchy brioche then melting cold tasty ice-cream, yum! I’m not a big fun of ice-cream so really trust me when I say it’s sooo good. “What’s Crema Catalana exactly?” I asked the waiter. “It’s like a crème brûlée but thinner.” Or maybe he said thicker. I can’t remember. Crema Catalana is indeed very similar to crème brûlée and is a famous Catalan dessert. If you like the French crème brûlée then you’ll like the crema Catalana. It was really hard not to notice all the amazing bakeries in Barcelona. After hours of wandering the city on foot, these bakeries were the perfect spot for a coffee break and a cake or two. You don’t even have to look for a Pastelaria, they are everywhere in La Rambla and Gothic Quarter. Croissants are available all day long which I approve of along with lemon pies, creamy sweet cakes and meringues. I may have lied when I said I didn’t do any research before heading to Barcelona. When I told a friend I was going, she shared with me an email she got from a Barcelonian friend containing all his favourite tapas bars. Although we didn’t go to the suggested bars, we tried but some of them were too busy. I guess they’ve been recommended to long queues of tourists we found just like they were recommended to us. We ate in the same area, the Gothic quarter and we were very satisfied with the food quality. It was all yummy! There are two ways to order tapas in these bars. You can have some of the small tapas on the bar, most of them are a piece of bread topped with jamon, fish or veg. You can also order bigger plates of tapas like Pedron peppers and Manchego cheese (which are a favourite of mine) from the menu. 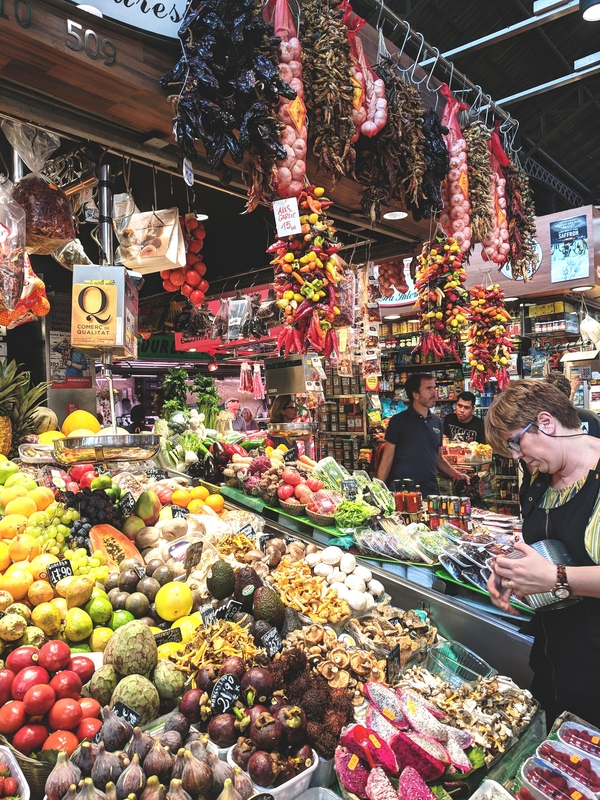 If you’ve been to Barcelona and have more culinary experiences to share, please comment on this post. Until the next culinary adventure!